For the second consecutive year, the professional school of Montemor-o-Velho won the bgreen grand prize and will, therefore, embark on an eco-adventure trip to the Azores in September. The Honorable Mention Award was attributed to Colégio Dom Diogo de Sousa for its video spot titled Gushy Words. The Italian students from Istituto Massimo seized the Bgreen Junior Award with the spot BURNING. In the category of Best Making Of, the award went to Norway and the students from Charlottenlund Videregaende Skole with the spot Karma. People’s Choice Award was given to Camilo Castelo Branco Secondary School with the spot Renascer das Cinzas. In the Alphonse Luisier category, dedicated to the students from Colégio das Caldinhas, the award went to a group of 1st year students from the Multimedia Technician Course of OFICINA – INA’s Professional School with the spot entitled BULLYING GREEN. All award winners and remaining video spots can be watched in OFICINA’s VIMEO video platform. Under the motto You are Nature, this year’s edition placed the emphasis in the relation between man and nature and more than a thousand people were present at the award ceremony at Fábrica de Santo Thyrso. Joaquim Couto, the mayor of Santo Tirso considered “bgreen to be a structural project for the municipality”, and concluded by making a very positive assessment of the festival’s 8 editions. 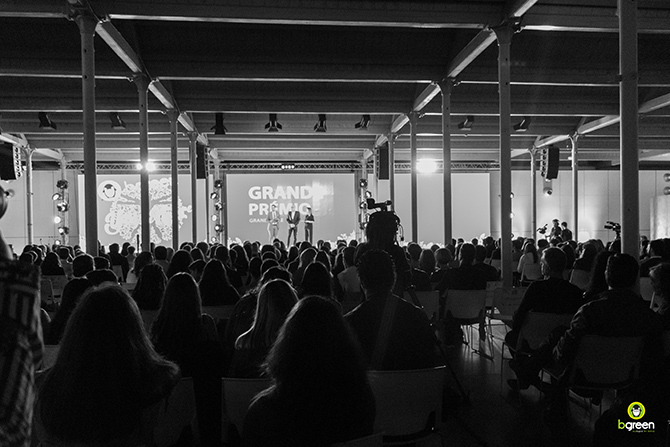 The Grand Gala included the presentations from ARTAVE – Vale do Ave’s Professional Artistic School, Backstage – Dance and Performative Arts School and also the National Institute of Circus Arts. OFICINA is grateful to the entire educational community and all those that enabled this 8th edition to become an outstanding celebration of education and ecology. Congratulations to all that participated and also the winners!